The pests that most people are uncomfortable with are the ones that can both fly and sting you; yes, we’re talking about bees and wasps.When one of these pests is swarming around you in a space, it doesn’t make much of a difference which one you’re dealing with, you just want it to go away. The same goes for when you’re a homeowner and you lay eyes on a nest in your yard. It’s just never a recipe for a good time when you are dealing with these pests. While you might not be concerned about which one of these pests you’re dealing with in your space, the way that you tackle caring for them is going to be completely different. At Colorado Pest Management, we provide the right type of services for the right type of pests. Doing so ensures that the pests that you’re dealing with are taken care of and that the long-term plan is what we have prioritized. In order to do that, we really need to understand the difference between these two pests, and it’s extremely beneficial for you to understand the difference as well. The first thing that we are going to cover today will be the size of colonies that each travel in. Bees are accustomed to having as many as 75,000 bees in a colony, while many wasp colonies will have less than 10,000 altogether. A queen bee will create the nest for a colony of bees, and they will continue to build on that nest over time. Since bees are able to create the food they need to survive, they don’t have to worry about moving their nest over time. Wasps, on the other hand, will build a nest and then hibernate in the cooler months. When temperatures start to warm up again, they will simply build a new nest, instead of returning to their old nest. Now, let’s get into the painful part of the pests that most of us hate: the stings. This is the part of the pest that people are most concerned about and for good reason. The stings of either of these insects can leave a person swollen, bruised and can even ignite an allergic reaction for some individuals. If you have been stung by a bee or a wasp, there’s a good chance that you’re pretty close to their nest. Both of these insects will only sting when trying to defend their nest or their colony. The stings can be a telling sign of which type of pest you’re dealing with if you’re unsure and are curious on how to care for the sting. Bees are only able to sting once, and after they have stung they will die. The reason behind this is that their stingers are actually barbed. Because of that, when they sting someone, the stinger gets stuck in the flesh. After trying to fly away the stuck stinger will pull out their abdomen and leave it in the skin. This kills the bee almost immediately but means that you need to be checking for the stinger when you’re cleaning up the wound. Wasps are able to sting multiple times without dying, making them the less favorable nest to have in your yard. They do not have barbed stingers, so you won’t have to worry about finding the stinger if you’ve been stung by a wasp. Wasps are a darker yellow, almost a gold. They can, however, also be a few different colors. Wasps have been seen in colors ranging from blue to green, but are most commonly yellow with hardly noticeable black streaks throughout their body. Wasps are also known for their slim bodies and thin legs. They have a shiny appearance because of the exterior of their body. Bees are going to have a fuller body and will have little hairs that cover their body, giving them a fuzzy appearance. They will vary in size, but will all have a rounder look to them. The characteristics of their appearance are what make it possible for them to collect pollen. 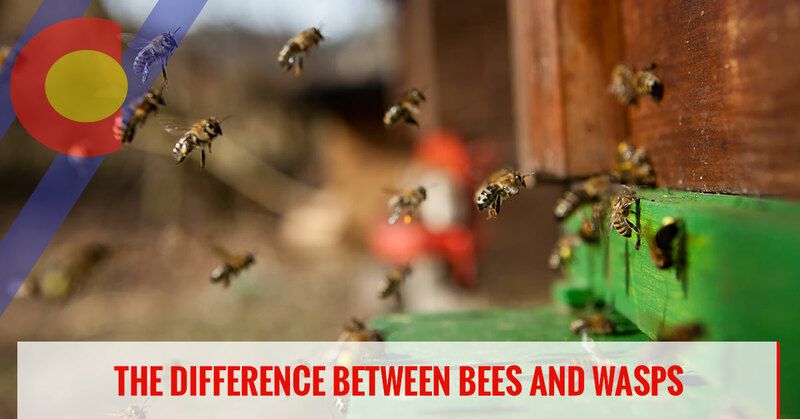 The two are extremely different, but it’s hard to separate them in the moment when you’re nervous about being stung in the first place. When you notice that there is a nest surrounding your home, don’t hesitate to contact our team of pest control professionals. If you have a nest in your yard, and you’re unsure what type of nest it is, don’t bother trying to get close and discover the answer on your own. 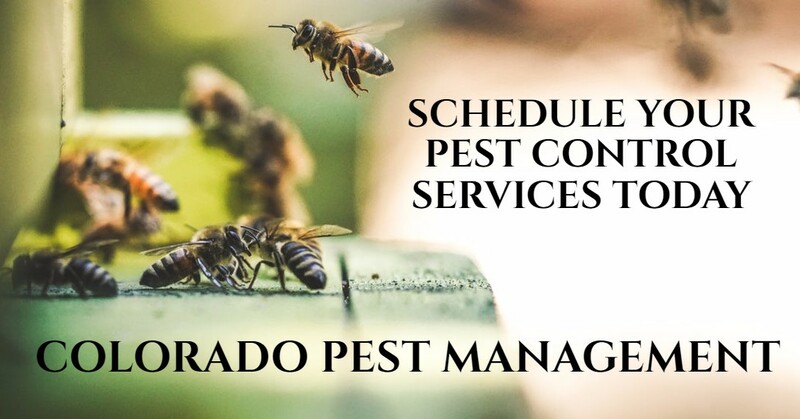 Contact Colorado Pest Management and we can come out and see what type of nest it is that you have in your yard so that we can properly care for it.